I confess. I love to paint seascapes. No, I won’t forsake the rolling golden hillsides of California’s precious central coast … nor the eucalyptus groves of Southern California, or the many treasures of the sierra nevada range. But there’s just something about the power and beauty of the surf that never ceases to inspire me. I have enjoyed going to Malibu from when I was a child – and at night some of my fondest dreams are still of being at the ocean. My father sunburned so easily that we could rarely go to the beach (this was long before SPF 50 sun block). So waves like these always fill me with nostalgia. Maybe I had a prior life as a beach bum. Or, more likely, a sand crab. Anyway, I digress. If you’d like to see the result of a year of painting this beautiful state, including a bounty of seascapes and sunsets, I hope you’ll come to our show at Descanso Gardens from this weekend through September 18. We hang the show on Friday morning, so that’s the official first day, but my guess is that things will be a little more relaxed over the weekend. Keep your fingers crossed that this marvelous weather continues. Oh, my! Another one that I really like. The colors are fantastic, and I love the composition. Great sky, waves, rocks …! This is truly incredible! I hate to sound “gushy” but this is one of the most beautiful seascapes I’ve seen…….. I love the green of the wave and the rocks. You painted this like you love it, which is obvious. So beautiful! 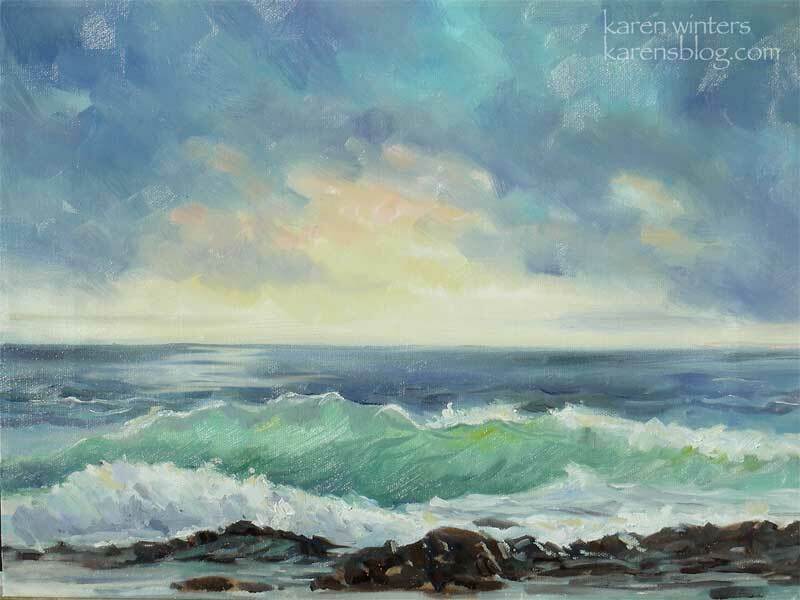 Yes, seascapes are special… Plus you get to sit by the sea and paint or walk along the shore with sand and water between your toes… Heaven! We talked about you yesterday at the CAC planning meeting. Your many talents are in great demand. I’d love to make it over to the show.. Is it every weekend that you’ll be there or only THIS weekend? Girl, you are going to make me move back if you keep this up. Oh my, this is beautiful! Something about the ocean, isn’t there? So powerful and so beautiful. You captured it brilliantly here. I wish you well on your show! Wish I was close enough to attend. 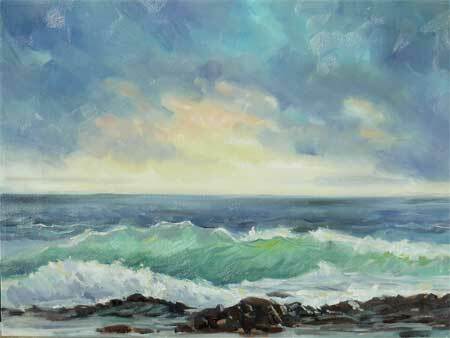 I think I like your seascapes better than any of your other paintings — just as you love to paint them, I love to look at them. This is definitely one of your best — so far. I really like the way you’ve complemented the colours of the water. The darkness of the rocks dont overpower the picture. I’m studying seascapes on oils at the moment. Do you have any tips to get the right colours, I can never put the images i see onto canvas.